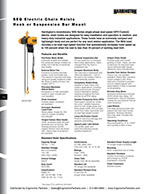 Capacities from 1/4-ton to 5-Tons! 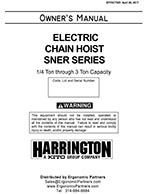 Grade 80, super strength nickel-plated load chain is certified to DIN standards, greatly reduces resistance due to fatigue and wear. Low maintenance: Due to no transformer, no magnetic contactor, no brake contactor and no brake coil. Compact Aluminum Body: Lightweight and offers low headroom. Paint is electrostatically applied. 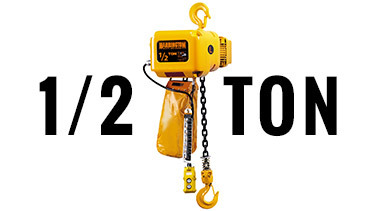 Unique Load Sheave: Five pockets are standard, reduces chain vibration and increases chain life. 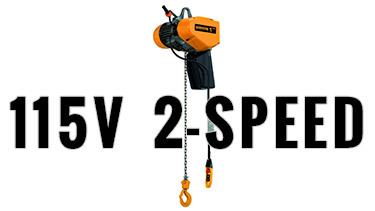 High-Speed Under No-Load: 72 fpm - Hoist speeds are 1.3 times faster when operating with less than 30% of full load capacity. 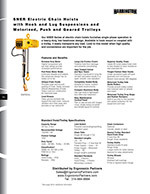 Limit Switches: Low-profile upper and lower limit switches are standard. High Air Flow: Heavy-duty cooler fan with engineered motor fins under the hoist body cover. Friction Clutch: standard on EQ/SEQ models. Provides consistent performance over a wide temperature range. 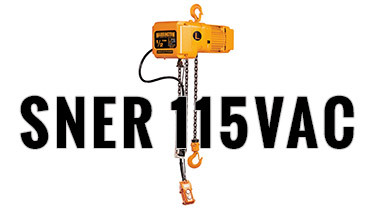 Standard Count Hour Meter: Records and displays the number of lifting/lowering starts and hoist on time which is valuable for preventive maintenance. Integral to VFD. Pull-Rotor Motor Brake: Extremely durable and reliable, this advanced design contains no brake coil to fail like conventional disc brakes. 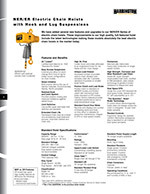 5-year hoist brake warranty. Maximum Number Starts per Hour: 120/240. Short Time Duty Rating: 30/10 min. 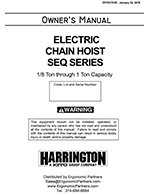 Load Chain: High Strength, Corrosion/Wear Resistant Grade 80, super strength, nickel-plated load chain, certified to DIN standards. Push Button Pendant: 4 ft. less than lift is standard. Easy-to-use, one-handed operation. Rated IP65. Standard control voltage is 24V. Strain relief wire is molded to pendant cord for added support and dependability. E-Stop is standard on all pendants. Made in Japan. 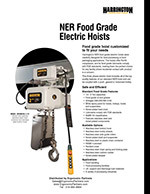 Warranty: Hoist manufacturer's warranty does not include on-site repairs. 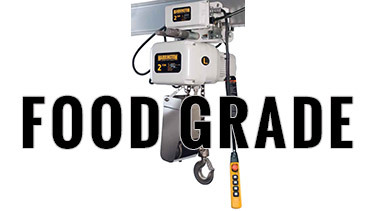 Customer will need to send the hoist, with freight pre-paid to EP's repair facility. 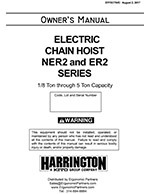 Ergonomic Partners carries all Harrington Chain Hoist models, including the NER, SNER, and SEQ. 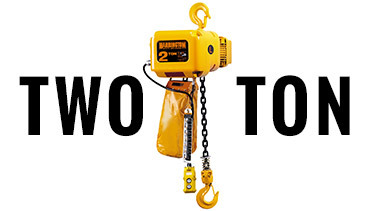 These Harrington hoists are used for applications as simple as lightweight, low duty lifting to high frequency heavy industrial lifting. 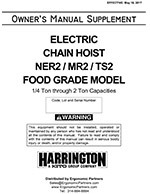 Harrington hoists typically have lower headroom and are lighter than the competition. 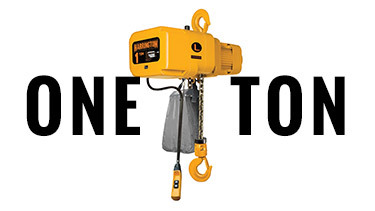 We specialize in the quick shipment of 1/4 Ton, 1/2 Ton, 1 ton, 2 ton hoists, and 3 ton electric hoists. 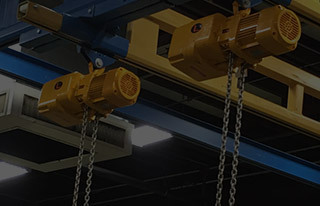 We are a distributor for Harrington electric hoists; serving clients from coast to coast, Canada, Mexico and especially focused in the states of Missouri, Illinois, Indiana, Kansas, Arkansas, Mississippi, Nebraska, Tennessee, Kentucky, Iowa, and Oklahoma.